There are many different brands, types, and power requirements for openers currently on the market and sifting through them may seem like a daunting task. Hopefully, this article will help educate on the differences between them all. With some understanding of different drive types, power class and cost, we hope you’ll be able to narrow your search to a model that will suit your unique needs. What Drive Type Should You Get? One of the first decisions you should make when looking to replace your old garage door opener or add one to a manual garage door is what type of drive you want. The most common types include Chain Driven, Screw Driven, Belt Driven, Direct Drive and Jack Shaft drives. Each of these has their pros and cons which we’ll detail for you here. Affordable and dependable but can be noisy. 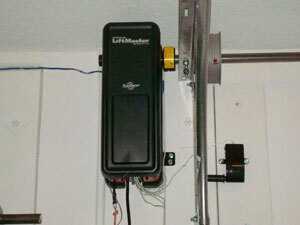 These types are the most common garage door opener system because of their balance between affordability and sturdiness. Using metal chains pulled by a gear, these openers can handle heavier garage doors quite easily with the relatively low cost to the homeowner. One of the drawbacks of chain drives, however, is that they can be excessively noisy. If you have a detached garage or your garage isn’t near a living space in your home, this won’t be much of an issue, but some homeowners prefer quieter options. Quieter but work best with smaller doors. A step up from chain drive openers regarding noise is the screw drive. This type of drive relies on a long threaded rod and gears to open and close the door. It has fewer moving parts than chain drives but requires some semi-regularly lubrication of the gear so that it doesn’t prematurely strip the rod from constant use. A downside to this type of drive is that it should only be used for smaller and lighter garage doors or for a one-car garage. Anything heavier can increase friction on the screw and wear it down prematurely but the overall function is quieter and faster than a chain drive. The quietest type of drive but slightly pricey. Similar in function to a chain driven opener, belt drives use a sturdy rubber belt around gear to pull your door. As you can expect, without as many metal parts involved in the operation, this type of drive is whisper quiet (relatively speaking) while providing reliable functionality. These openers can be pricier than their mechanical counterparts, so be prepared to pay for the peace. Offer flexibility and space saving but come with a hefty price. 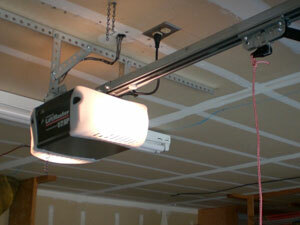 Storage space is a premium when it comes to your garage, and a jackshaft system works with that in mind. With the motor attaching to the wall beside the door, it uses a system of pulleys and cables to open the garage while saving you vertical space. This system is exceptionally quiet, but due to the compact technological wizardry involved, they are the most expensive systems you can buy. Direct drive systems are unique in that the motor itself rides along the track of the garage door itself. Although they do rely on a centrally located chain and rail system, they still leave a smaller footprint and preserving some vertical space. They are very dependable and reasonably close in price to belt drive systems while remaining quiet. 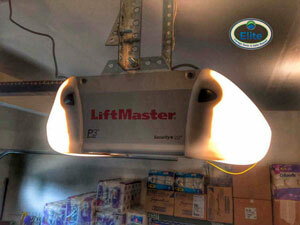 Choosing a garage door opener shouldn’t be a quick or easy choice. Look at your setup and the space used for your garage then discuss your options with a certified technician before deciding which type works best for your particular situation. Then it’s just a matter of installing the opener yourself or hiring a pro. Armed with the knowledge presented in this article, we hope you will have a better understanding of your needs before investing in one of these systems.